Background: Oral bosentan is an established treatment for pulmonary arterial hypertension (PAH). Objective: To evaluate safety, tolerability, and clinical and haemodynamic effects of bosentan in patients with PAH related to congenital heart disease (CHD). Patients: 22 patients with CHD related PAH (8 men, 14 women, mean (SD) age 38 (10) years) were treated with oral bosentan (62.5 mg×2/day for the first 4 weeks and then 125 mg×2/day). Main outcome measures: Clinical status, liver enzymes, World Health Organisation (WHO) functional class, resting oxygen saturations and 6-min walk test (6MWT) were assessed at baseline and at 1, 3, 6, and 12 months. Haemodynamic evaluation with cardiac catheterisation was performed at baseline and at 12 month follow-up. Results: 12 patients had ventricular septal defect, 5 atrioventricular canal, 4 single ventricle, and 1 atrial septal defect. All patients tolerated bosentan well. No major side effects were seen. After a year of treatment, an improvement was seen in WHO functional class (2.5 (0.7) v 3.1 (0.7); p<0.05), oxygen saturation at rest (87 (6%) v 81 (9); p<0.001), heart rate at rest (81 (10) v 87 (14) bpm; p<0.05), distance travelled in the 6MWT (394 (73) v 320 (108) m; p<0.001), oxygen saturation at the end of the 6MWT (71 (14) v 63 (17%); p<0.05), Borg index (5.3 (1.8) v 6.5 (1.3); p<0.001), pulmonary vascular resistances index (14 (9) v 22 (12) WU m2; p<0.001), systemic vascular resistances index (23 (11) v 27 (10) WU.m2; p<0.01), pulmonary vascular resistances index/systemic vascular resistances index (0.6 (0.5) v 0.9 (0.6); p<0.05); pulmonary (4.0 (1.3) v 2.8 (0.9) l/min/m2; p<0.001) and systemic cardiac output (4.2 (1.4) v 3.4 (1.1) l/min/m2; p<0.05). Conclusions: Bosentan was safe and well tolerated in adults with CHD related PAH during 12 months of treatment. Clinical status, exercise tolerance, and pulmonary haemodynamics improved considerably. The aim of this open label, single arm, prospective study was to evaluate the safety and tolerability of oral bosentan treatment in 24 consecutive adult patients with Eisenmenger physiology by assessing its long term effects on clinical status, exercise capacity, and cardiopulmonary haemodynamics. Patients with PAH due to unoperated non-restrictive intracardiac communication with a bidirectional or a right-to-left shunt (Eisenmenger pathophysiology) were enrolled. Concomitant causes of pulmonary hypertension such as lung or liver disease were excluded using mandatory chest x ray, respiratory function, perfusion lung scan, high resolution computed tomography scan, spiral CT scan and abdominal ultrasound. No patient was receiving calcium channel blockers as they were unresponsive to acute vasodilator testing in prior haemodynamic evaluation. No other drugs effective in PAH were used during the treatment period. Informed patient consent was obtained before entering the study, and the protocol was approved by the institutional ethics committee. Enrolled patients weighed >40 kg, had been in a stable condition for at least 3 months before entering the study and were in World Health Organisation (WHO) functional class II–IV. Additionally, enrolled patients had resting systemic arterial oxygen saturations of <90% and >60% at rest in room air and were not pregnant. This was an open label, single arm, prospective study. Bosentan (Tracleer; Actelion Pharmaceuticals, Allschwil, Switzerland) was started at an oral dose of 62.5 mg twice a day and increased to the target dose of 125 mg twice a day after 4 weeks. Clinical assessment and laboratory tests, including haemoglobin, packed cell volume, and liver function tests (aspartate aminotransferase/alanine aminotransferase) were performed at baseline (before initiating bosentan treatment) and monthly, or whenever the patients’ clinical status was determined. Evaluation of exercise tolerance with 6-min walk test (6MWT)18 was performed at baseline and at 1, 3, 6 and 12 month follow-up evaluation; cardiac catheterisation was performed at baseline and at the 12 month follow-up evaluation. Clinical assessment included medical examination with WHO classification and measurement of systemic arterial pressure, transcutaneous oxygen saturation, and heart rate. Resting systemic arterial oxygen saturation was measured indirectly by non-invasive finger pulse oximetry after 5 min of absolute rest in the sitting position, and the mean of three consecutive readings was recorded for analysis. Clinical findings such as pretibial oedema, jugular venous pulse, and hepatomegaly were observed. Monitoring also included monthly measurements of liver enzymes, with a focus on alanine aminotransferase and aspartate aminotransferase and 3-monthly measurements of packed cell volume, haemoglobin, and serum iron. Exercise capacity was evaluated with an non-encouraged 6MWT18 (at baseline 6-min walking distance was calculated as the best distance covered on two consecutive tests performed after 60–90 min). Heart rate, saturation of peripheral oxygen were recorded at rest and at the end of exercise, Borg dyspnoea index was evaluated at completion of the test. All 6MWTs were performed in a 25-m-long corridor in the same environmental conditions and at about the same time of day (±2 h). Haemodynamic assessment was performed at baseline and after 12 months of treatment by right heart catheterisation. Pulmonary arterial, right atrial, and pulmonary capillary wedge pressures and systemic pressures were recorded at the end of a quiet respiratory cycle. Oxygen saturations in the superior vena cava, inferior vena cava, pulmonary artery, and femoral artery were obtained in triplicate. Pulmonary vein saturation was assumed at 98%. Pulmonary and systemic flows were obtained by the Fick principle using table-derived oxygen consumption values and calculated oxygen content at the correspondent different sites.19 The transpulmonary pressure gradient was defined as the difference between the mean pulmonary arterial pressure and the mean pulmonary capillary wedge. Pulmonary and systemic vascular resistance indices were calculated using the standard formula. All values are presented as mean (SD) except when otherwise indicated. Changes from baseline to month 12 were evaluated with a paired t test for continuous variables and with Wilcoxon’s rank sum test for categorical variable. A value of p<0.05 was considered to be significant. All the reported p values were two tailed. A total of 24 consecutive adult patients with pulmonary hypertension from CHD were enrolled. After 1–2 weeks of treatment, two patients (8.3%) withdrew from drug treatment because of severe leg oedema despite an increased diuretic dose and were not considered in the analysis. In the 22 participating patients, conventional treatment with oxygen, diuretics, digoxin or warfarin was continued during the study, with little change. No patient used calcium channel blockers (tables 1 and 2). Mean (SD) treatment duration was 12.3 (3.3) months (range 9–16). Bosentan treatment was generally well tolerated. No deaths or any serious adverse drug reactions were noted. Aspartate aminotransferase and alanine aminotransferase plasma levels remained below three times the upper limit of normal in all but three patients throughout the observation period. In these three patients, showing a rise in the aminotransferase level of four times the upper limit of normal, the dose of bosentan at 2 months of observation was reduced from 125 mg twice a day to 62.5 mg twice a day, with a complete normalisation of the aminotransferase level. These three patients continued receiving 62.5 mg twice a day during the follow-up. One patient required a bosentan dose reduction from 125 mg twice a day to 62.5 mg twice a day owing to the development of moderate leg oedema. Finally, 18 of 22 patients received bosentan 125 mg twice a day and 4 of 22 received bosentan 62.5 mg twice a day during the follow-up. The changes from baseline to 1 year of bosentan treatment in clinical, pulse oximetry exercise capacity, and haemodynamic status are shown in table 3 and in figs 1 and 2. (A) Travelled distance at 6-min walk test (6MWT). (B) Heart rate at the end of 6MWT. Open bars: basal condition; black bars: 1 year follow-up. 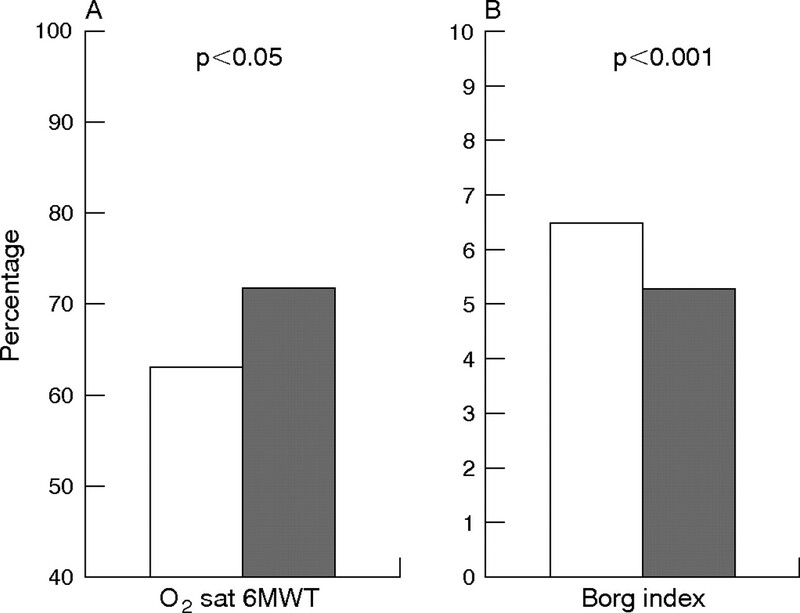 (A) Oxygen saturation at the end of 6-min walk test (6MWT). (B) Borg index at 6MWT. Open bars: basal condition; black bars: 1 year follow-up. At baseline, four patients were in WHO class II, 12 in class III and 6 in class IV. After 12 months of treatment improvement by at least one WHO class occurred in 14 and the class remained unchanged in eight patients, resulting in a statistically significant improvement. 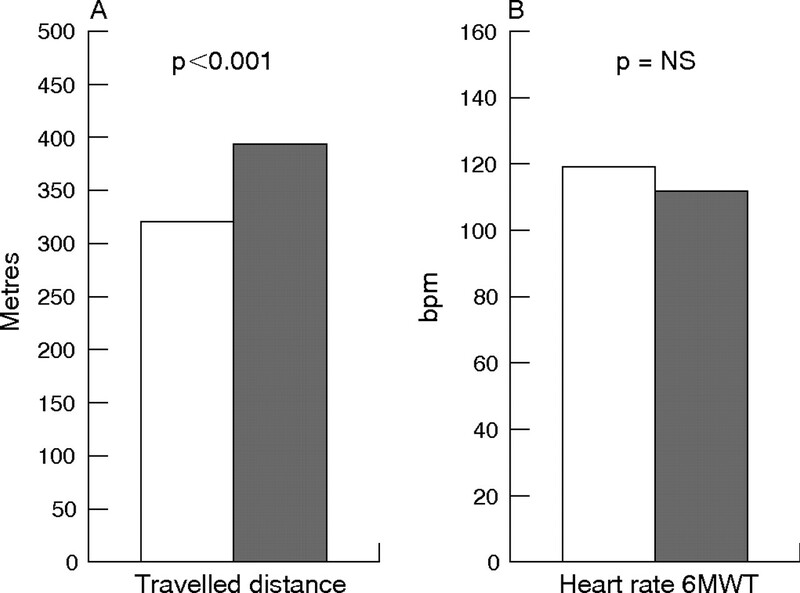 Similarly, effort tolerance improved from baseline as shown by the significant increase in the 6-min walk distance (67.3 (75) m, p<0.001; fig 1) with a reduction in the Borg dyspnoea index (−1.5 (2), p = 0.001). After a year of treatment, pulse oximetry significantly increased at rest (5.3 (5.1)%, p = 0.001) and at the end of the walking test (4.9 (9.6)%, p<0.05). A comparison of the haemodynamic status with baseline showed a significant reduction in pulmonary vascular resistances index (PVRi: −9.7 (1) WU.m2, p<0.001) and systemic vascular resistances index (SVRi: −4.5 (1) WU.m2; p<0.01) with a concomitant reduction of PVRi/SVRi (−0.25 (0.1); p<0.05). Moreover, we observed an increase in pulmonary flow (1.1 (1.1) l/min, p = 0.001) and systemic flow (0.6 (1.1) l/min, p = 0.05), with a small, but non-significant modification in pulmonary and systemic pressure. The Bosentan Randomised Trial of Endothelin Antagonist Therapy-5,17 a 16 week, multicentre, randomised, double blind, placebo controlled study, recently evaluated the effect of bosentan in 54 patients with WHO functional class III Eisenmenger syndrome. The placebo corrected effect on systemic pulse oximetry showed that bosentan did not worsen oxygen saturation. Moreover, compared with placebo, bosentan improved exercise capacity and haemodynamics: treatment effect on 6MWT of 53.1 m, and significant reduction of PVRi, mean pulmonary arterial pressure, SVRi, and mean systemic arterial pressure. In all, four patients discontinued the trial as a result of adverse events, two (5%) in the bosentan group and two (12%) in the placebo group. Our results confirm these previous observations, suggesting that patients with CHD related PAH have a sustained benefit from long term bosentan therapy. Our findings agree with previous observations,15–23 ruling out the hypothesis that bosentan has a greater effect on systemic circulation than the obstructed pulmonary vascular bed of patients with Eisenmenger syndrome, and could worsen systemic hypoxaemia as a result of increased in right-to-left shunt. Experimental data showed that endothelin-1 not only modulates vascular smooth muscle tone24 but also promotes cellular proliferation,25 initiates cardiac myocyte,26 and non-myocyte27 hypertrophy, and regulates secretion of neurohormonal mediators of cardiac and vascular hypertrophy.28 Bosentan, an oral ET-A/ET-B inhibitor, not only prevents the development of pulmonary hypertension but can also reverse established pulmonary hypertension and pulmonary vascular remodelling induced by chronic hypoxia.29 These experimental observations may explain the long term efficacy of oral bosentan in patients with Eisenmenger physiology as a result of its favourable effect on pulmonary vessel remodelling. In patients with Eisenmenger syndrome there remains a theoretical point of concern using a non-selective pulmonary vasodilator: the possible increase in right-to-left shunt. However, in our population during bosentan treatment we saw no reduction in resting or exercise saturation of peripheral oxygen compared with baseline. Bosentan treatment for 1 year caused a greater reduction in right ventricular than in the left ventricular afterload, resulting in a reduction in the right-to-left shunt, an improvement in pulmonary blood flow, and ultimately, in systemic oxygen delivery. This pathophysiological mechanism explains the significant improvement in clinical status and effort tolerance seen during the follow-up. These results need to be viewed against the background of several potential limitations. Firstly, this study was not controlled, and therefore, the contribution of a placebo effect is unknown. However, an attempt was made to exclude this effect by allowing no less than a 9 month treatment. Placebo effects disappear after 1–2 months in randomised controlled studies.14 Secondly, in the absence of randomisation procedures, the influence of unknown bias—for example, through patient selection, cannot be determined. Finally, the specific type of intracardiac abnormality largely determines the natural history and therefore, ideally, the response to any treatment should be compared with the long term outcome in that particular abnormality. MacMahon B, McKeown T, Record RG. The incidence and life expectation of children with heart disease. Br Heart J1953;15:121–9. Wood P. The Eisenmenger syndrome or pulmonary hypertension with reversed central shunt. BMJ1958;46:755–62. Farber HW, Loscalzo J. Pulmonary arterial hypertension. N Engl J Med2004;351:1655–65. Daliento L, Somerville J, Presbitero P, et al. Eisenmenger syndrome. Factors relating to deterioration and death. Eur Heart J1998;19:1845–55. Galie N, Torbicki A, Barst R, et al. Guidelines on diagnosis and treatment of PAH. The Task Force on Diagnosis and Treatment of Pulmonary Arterial Hypertension of the European Society of Cardiology. Eur Heart J2004;25:2243–78. Hopkins WE, Ochoa LL, Richardson GW, et al. Comparison of the hemodynamics and survival of adults with severe primary pulmonary hypertension or Eisenmenger syndrome. J Heart Lung Transplant1996;15:100–5. Berman EB, Barst RJ. Eisenmenger’s syndrome: current management. Prog Cardiovasc Dis2002;45:129–38. Rubin LJ, Badesch DB, Barst RJ, et al. Bosentan therapy for pulmonary arterial hypertension. N Engl J Med2002;346:896–903. Galie N, Seeger W, Naeije R, et al. Comparative analysis of clinical trials and evidence-based treatment algorithm in pulmonary arterial hypertension. J Am Coll Cardiol2004;43:81–8S. McLaughlin VV, Sitbon O, Badesch DB, et al. Survival with first-line bosentan in patients with primary pulmonary hypertension. Eur Respir J2005;25:244–9. Galie N, Manes A, Branzi A. The endothelin system in pulmonary arterial hypertension. Cardiovasc Res2004;61:227–37. Tutar HE, Imamoglu A, Atalay S, et al. Plasma endothelin-1 levels in patients with left to-right shunt with or without pulmonary hypertension. Int J Cardiol1999;70:57–62. Adatia I, Haworth SG. Circulating endothelin in children with congenital heart disease. Br Heart J1993;69:233–6. Channick RN, Simonneau G, Sitbon O, et al. Effects of the dual endothelin-receptor antagonist bosentan in patients with pulmonary hypertension: a randomised placebo-controlled study. Lancet2001;358:1119–23. Gatzoulis MA, Rogers P, Wei L, et al. Safety and tolerability of bosentan in adults with Eisenmenger physiology. Int J Cardiol2005;98:147–51. Schulze-Neick I, Gilbert N, Ewert R, et al. Adult patients with congenital heart disease and pulmonary hypertension: first open prospective multicenter study of bosentan therapy. Am Heart J2005;150:716. Galiè N, Beghetti M, Gatzoulis MA, et al. Bosentan therapy in patients with Eisenmenger syndrome. A multicenter, double-blind, randomized, placebo-controlled study. Circulation2006;114:48–54. Guyatt GH, Sullivan MJ, Thompson PJ, et al. The 6 min walk: a new measure of exercise capacity in patients with chronic heart failure. Can Med Assoc J1985;132:919–23. Grossman W. Clinical measurement of vascular resistance and assessment of vasodilator drugs. In: Grossman W, ed. Cardiac catheterization and angiography. Philadelphia, PA: Lea and Febiger, 1991:143–51. Christensen DD, McConnell ME, Book WM, et al. Initial experience with Bosentan therapy in patients with the Eisenmenger syndrome. Am J Cardiol2004;94:261–3. Apostolopoulou SC, Manginas A, Cokkinos DV, et al. Effect of the oral endothelin antagonist bosentan on the clinical, exercise and haemodynamic status of patients with pulmonary arterial hypertension related to congenital heart disease. Heart2005;91:1447–52. Barst RJ, Ivy D, Dingemanse J, et al. Pharmacokinetics, safety, and efficacy of bosentan in pediatric patients with pulmonary arterial hypertension. Clin Pharmacol Ther2003;73:372–82. Rosenzweig E, Ivy D, Widlitz A, et al. Effects of long-term bosentan in children with pulmonary arterial hypertension. J Am Coll Cardiol2005;46:697–704. Ohlstein EH, Douglas SA. Endothelin-1 modulates vascular smooth muscle structure and vasomotion: implications in cardiovascular pathology. Drug Dev Res1993;29:108–28. Morbidelli L, Orlando C, Maggi CA, et al. Proliferation and migration of endothelial cells is promoted by endothelins via activation of ETB receptors. Am J Physiol1995;269:686–95. Ito H, Hirata Y, Hiroe M, et al. Endothelin-1 induces hypertrophy with enhanced expression of muscle-specific genes in cultured neonatal rat cardiomyocytes. Circ Res1991;69:209–15. Takanashi M, Endoh M. Characterization of positive inotropic effect of endothelin on mammalian ventricular myocardium. Am J Physiol1991;261:611–19. Otsuka A, Mikami H, Katahira K, et al. Changes in plasma renin activity and aldosterone concentration in response to endothelin injection in dogs. Acta Endocrinol1989;121:361–4. Chen SJ, Chen YF, Meng QC, et al. Endothelin-receptor antagonist bosentan prevents and reverses hypoxic pulmonary hypertension in rats. J Appl Physiol1995;79:2122–31. Humbert M, van Lierop C, Kiely DG, et al. Long term safety profile of bosentan in patients with pulmonary arterial hypertension: results from the European surveillance program. Data on file. Allschwil, Switzerland: Actelion Pharmaceuticals, 2004. ↵* M D’Alto and C D Vizza contributed equally to this study.